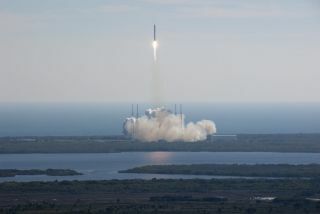 SpaceX's Falcon 9 rocket and Dragon spacecraft lift off from Launch Complex 40 at Cape Canaveral Air Force Station at 10:43 a.m. EST in this photo taken Dec. 8, 2010 during the key space capsule flight test for NASA's commercial orbital space transportation program. A throng of industry heavyweights will descend on Washington for a two-day conference on commercial space transportation beginning tomorrow (Feb. 9). The Federal Aviation Administration's 14th annual Commercial Space Transportation Conference is being held at the Walter E. Washington Convention Center and will bring together government officials and industry leaders in commercial spaceflight. The conference comes at a busy time for the industry. Alliant Techsystems (ATK), a longtime NASA contractor, announced yesterday that it has teamed up with European aerospace company Astrium to repurpose the first stage of NASA's scrapped Ares I rocket as a completely new commercial launch vehicle. ATK and Astrium are proposing to enter the newly renamed Liberty rocket for NASA's Commercial Crew Development-2 competition, which is seeking proposals for commercial spacecraft to transport astronauts to and from space. At the FAA conference, panelists from international launch companies and government agencies will spend two days discussing new technologies, spaceflight gear, orbital and suborbital launch vehicles, and international legal issues for commercial space transportation. - Brewster Shaw, vice president and general manager of the Boeing Space Exploration wing of the Boeing Co.
- Wayne Hale, former NASA shuttle manager and current director of human spaceflight programs at Special Aerospace Services, a Boulder, Colo., consulting firm. The FAA plans to address key issues in the U.S. commercial space transportation sector and discuss the future direction of this growing industry. The annual conference brings officials from the FAA, NASA, Department of Transportation and Department of Defense together with private industry leaders, international space partners, current and former astronauts and space enthusiasts.